In December 1991 Dodson's Grand Rental Station opened its doors, and completed a quarter century in business in 2016. In December 2016 Dodson's Grand Rental Station became Stellar Rentals Texas. We are 100% locally owned and operated and are a proud member of the Burleson Chamber of Commerce. We offer a wide variety of rental equipment including some larger equipment that was not previously offered. Check out our selection under the "products" tab or stop in and take a look. We specialize in providing the rental equipment that our customers need from the homeowner to the contractor, and customer service is our number one priority! Did you know we deliver?! 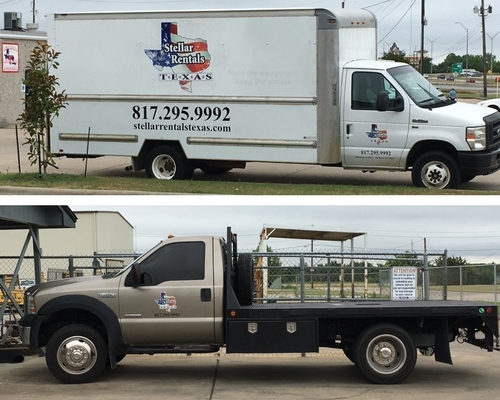 We have a truck for delivering equipment and a box truck for delivering tables, chairs and party stuff! Stop in or give us a call for more details. "All your rental needs under one roof!"